Whilst all armies have to contend with the problems of transportation when on campaign, those facing the Japanese in World War II were particularly daunting. In China the issue was the vast area of combat with often difficult terrain, while in the Pacific War the troops were scattered over numerous countries and islands, frequently thickly covered with vegetation that also made transport very difficult. Coupled with a severe shortage of transportation, the Japanese were particularly known for their use of bicycles (generally stolen from the local population) of which the campaign in Malaya in 1942 is perhaps the best example. 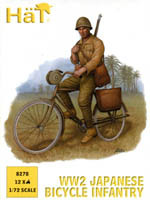 However in the jungle the use of bicycles could have many advantages, moving much quicker than mechanical transport, and bicycle troops were often in the vanguard of attacks. The set invokes images of jungle warfare in particular because all the men wear tropical uniform, which is to say a shirt (but no tunic), trousers and puttees. Two of the men wear the peaked field cap, one of which has a very peculiar sort of part neck shield which is two very long strips that don't even meet at the back and is nothing like the actual item. The remaining two men wear what could either be helmets or sun hats - both are authentic. All have waist belts with a single ammunition pouch on the front and the reserve pouch in the small of the back. They also have haversacks, canteens and possibly some other item - the sculpting is not nearly precise enough to make any certain identification. Apart from the odd neck curtain, however, all the uniform and kit here is accurate. Troops moved rapidly on bicycles but of course did not actually fight on them, so all the poses are simply on the move (i.e. no one has a foot down). There is really not much variety you could bring to such poses, and here we have men holding one or both handlebars and either looking to the front or to one side. Having a stopped pose might have been worthwhile, or perhaps one walking with his cycle, but although there are just four poses they pretty much deliver most of what you could want from such figures. The variety lies in the clothing as already mentioned, and in the weapons, in that three have rifles on their back and the fourth is carrying a Type 96 light machine gun, although strangely this has a magazine actually inserted, making it heavier and more awkward than necessary. Perhaps the weakness of this set is that it is made in quite a soft and malleable plastic, yet requires a good deal of assembly. Many of the men’s arms are separate, as are the handlebars of the bikes, and we found it quite a challenge to put everything together such that it all matched up correctly. It can be done, but the soft plastic makes it a difficult task. The general sculpting is pretty good although the detail is not particularly sharp, but the proportions are fine and there is no flash. As we have said, the bikes could come from any source and the Japanese were famously little concerned about neat appearance, so the mix of panniers and kit attached to the bikes is pleasing. One curiosity is that all the bikes have their drivetrains on the left side rather than the more usual right. These are decent figures, and an interesting element of the Imperial Japanese Army not previously modelled in plastic, but the nature of the poses has meant they have to be multi-part, so be prepared for some very fiddly assembly before they can cycle off to the front.